This programmer was designed in view of to be flexible, economical and easy to built, the programmer hardware utilizes the standard TTL series parts and no special components are used. The programmer is interfaced with the PC parallel port and there is no special requirement for the PC parallel port, so the older computers can also be used with this programmer. 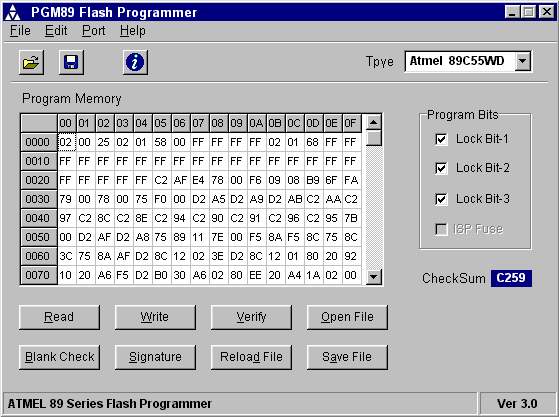 Figure 1 shows the circuit diagram of the Flash Programmer, the programmer is interfaced with the standard parallel port of the PC. As shown in the diagram U2 is used to control the data flow between the controller and the PC, U4 latched the low order address byte and U5 latched the high order address byte, while U3 is used to generate the control signals for micro controller to be programmed. IC U1 is used to generate the progrram pulse for the u-controller. The power supply section uses U8 to generate the logic 5V supply while the U7 is used to provide the programming supply voltage to controller. IC U6 is used to generate the VDD power supply voltage for the u-controller which is selectable either 5v or 6v5. The prototype board may be built using universal PCB with point-to-point wiring. If you want to make your own PCB, download the PcbsPgm89v3.zip file which contains the printer files for the HP laser printer or download the PcbsPCX.zip file which contains PCX graphics format pcb files. Figure 3 shows the components layout of the programmer pcb. The schematics and the pcbs of the project were designed using OrCAD software. Study the web page and the readme file included in the port driver zip file for further information. In order to insure safe insertion & removal of the u-controller from programmer ZIF socket make sure programmer power supply is turned on before starting the program and the red LED D1 must be turned off when the program is started. The u-controller should be placed or removed from the ZIF socket when the red LED D1 is off. Also note that the software does not provide the erase command because this function is performed automatically during device programming. If you are required to erase the controller first use the clear buffer command in edit menu then program the controller, this will erase the controller memory. Any bug reports or suggestion of using the Flash Programmer are welcome.